Why Choose A Rent to Own Shed Option For My Outdoor Shed? 07 Sep Why Choose A Rent to Own Shed Option For My Outdoor Shed? Ever wish that your house had just a little more space? Well, who hasn’t? Buying an outdoor shed is a great solution to add space to your home. And you can use that space for storage, personal projects, or anything in between! However, such sheds can be too expensive for some people. That’s why we have the perfect solution: rent to own sheds that we build from the ground up. Barnyard Utility Buildings knows a lot about why you should rent to own sheds in North Carolina and South Carolina. Before we dive in, though, it’s important to answer a more fundamental question Why use storage sheds at all? The truth is that there are countless possible uses for outdoor sheds. Some people, for instance, like to turn this into a workspace: somewhere where they can work on various projects without disturbing their family or cluttering up the house. Other people use the shed almost like an outdoor “man cave” or “she shed”. This becomes a space where people can unwind, entertain friends, and do anything from play cards to rock out on the guitar. And, of course, many people use these outdoor sheds for storage. This helps you avoid cluttering up your house, and it’s both more affordable and accessible than keeping your things in an offsite storage location. Now you know some of the general benefits that outdoor sheds can offer. 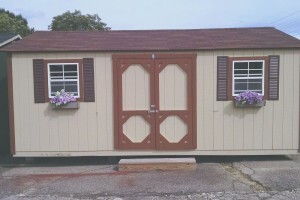 Keep reading to discover the specific benefits of our rent to own sheds! One of the biggest benefits of our rent to own sheds is that it offers both convenience and space. Simply put, there is no better option when it comes to storage and anything else you want to do with your shed! First, we can create custom sheds for you (more on this later). This means that we can provide all the storage space you need and none of the space you don’t need. After all, no one wants a shed that takes up half the space of their yard! Second, these sheds will dramatically free up space within your home. Not everyone has a garage or other space where they can store various items. If you’re not careful, the inside of your house may look like something out of the Hoarders TV show! By getting a rent to own storage shed, you don’t just get the storage space you need. On a very real level, you get your home back! As useful as outdoors sheds are, they represent a significant investment. And if we’re being honest, most of our customers aren’t ready to buy one of these sheds outright, as they are worried that it might be too expensive for them to manage. That’s why we offer rent to own sheds in North Carolina and rent to own sheds in South Carolina. Instead of paying a hefty fee up front, you instead pay modest monthly installments. This gives you the convenience of immediate shed access without putting a big dent in your lifestyle. It really is that simple. You get all the convenience of renting (including low payments), but when all is said and done, you’ll own your very own shed! If you’re looking into outdoor sheds, you’ve probably noticed that plenty of places offer pre-made sheds for you to buy. This looks nice and convenient…right up until the point where you have to bring the thing home! We take care of this problem in the best possible way. First of all, our outdoor sheds are made to your specifications. Why settle for something pre-made when you can have us build the shed of your dreams? And speaking of building, that’s exactly what happens. We will come out to your property and build the shed you want from the ground up. You don’t have to worry about how to bring your dream shed back home; all you have to do is walk out to the backyard and enjoy it! As we said earlier, there are some fundamental problems with pre-made sheds. The biggest problem, though, is that the size and design of the sheds you find may not be suitable for your particular needs. We don’t think you should be forced to adapt to someone else’s design. Instead, once you tell us what you need the shed for, we design a custom shed that is perfectly suited to your needs. Want a shed that your kids can use as a playhouse? We can make it happen. Need a small space to tuck away the lawnmower? We can make that happen, too! You’ve got specific needs and we’ve got specific solutions. Some people think they don’t need to look into rent to own sheds in North Carolina and rent to own sheds in South Carolina. They think there is a simpler solution. They’ll just build it themselves! And hey, if you’ve got the skills, experience, and tools, we’re sure you’ll do a great job. But most people get overwhelmed by this kind of personal project. It ends up taking every spare minute and every weekend, consuming valuable time you’d rather spend with family. And if you have to buy a bunch of special tools, then you’re cutting into that money you thought you’d save. We’re basically your “one stop shop” when it comes to storage sheds. That means we take care of everything while you’ve got it made in the shade. Not only do we have the right tools for the job, but we have the engineering experience required to build the best possible sheds. At the end of the day, we’re not just out here to build sheds. We’re out here to build sheds you can use your entire life! Our rent to own sheds are the solution to all of your space problems. Whether you need simple storage or a space as big as your child’s imagination, we can build it. And with our affordable financing, you can see just how affordable the shed of your dreams really is!